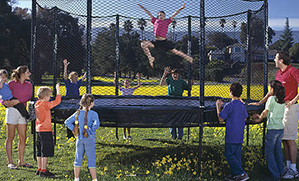 When it comes to purchasing a trampoline for your children, safety should be your top concern. For your convenience, Wooden Swing Co.keeps only the safest and most secure brands of trampolines in stock. Serving the Greater Dallas area for nearly 40 years, this family owned and operated retail outlet offers everything you need to transform your backyard into a children’s entertainment paradise. From play structures and swing sets to basketball hoops and trampolines, these friendly professionals will make sure you find everything you need to maximize your family’s outdoor fun. Trampolines are the perfect way for kids to have a blast while getting some exercise, and you deserve to rest assured knowing your children are protected in their own backyard. This is why Wooden Swing Co. carries AlleyOOP Double Bounce trampolines, which are considered to be among the safest on the market. 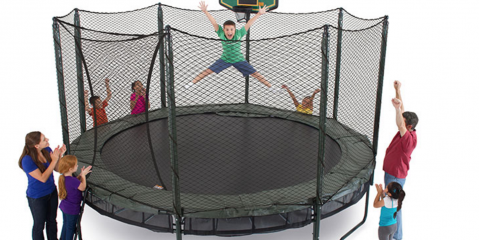 These trampolines have an overall safety rating of 9.8 out of 10, and what’s even better is they have a lifespan of 10 to 20 years. AlleyOOP trampolines have a five-star consumer rating, and they proudly carry an A+ rating with the Better Business Bureau. When you want a secure, durable, and affordable trampoline, invest in AlleyOOP brand trampolines from Wooden Swing Co. today. 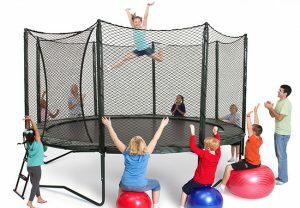 For the very best selection of trampolines and other outdoor entertainment equipment, rely on the helpful staff at Wooden Swing Co. to help you find everything you need to increase your family’s livelihood. Call (972) 386-6280 today to speak with a welcoming customer service representative about investing in AlleyOOP brand trampolines. 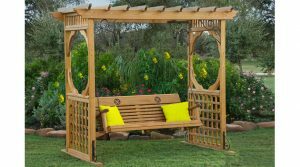 You can also visit them online for details about play structures, swing sets, basketball hoops, and a variety of other valuable products. Having been in business for more than 35 years, Dallas and Fort Worth parents trust us for their children’s furniture. We provide the three major items a parent thinks about when investing for their children: quality, safety, and fun! Come by the store (Inwood and Alpha, across the Tollway from the Galleria Mall) or call us at 972-386-6280! 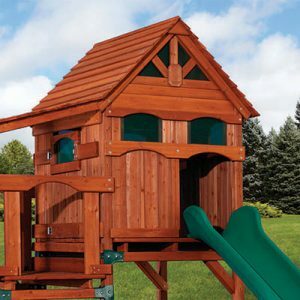 Backyard Playsets: Healthy or Fun? Huge Playground & Patio Furniture Floor Model Closeout Sale In Dallas!